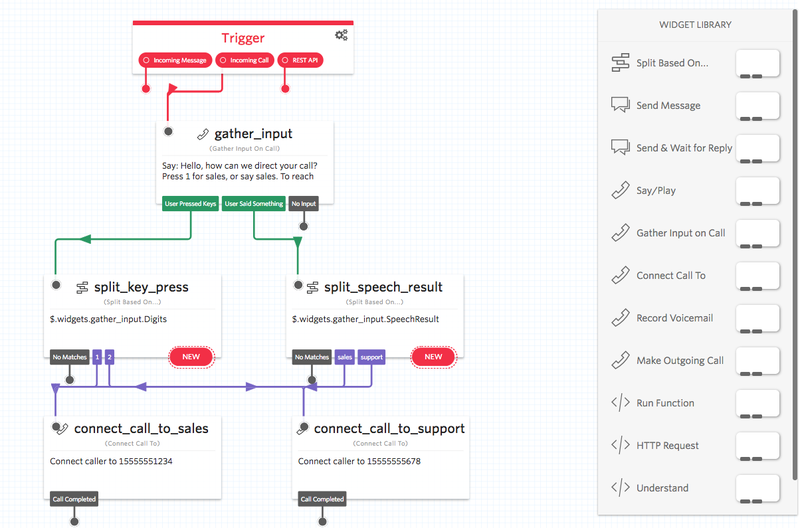 Now developers can visually create, edit, and manage communication workflows in Studio, Twilio's visual application builder. Drag and drop widgets to build voice, messaging, and communications apps, and save the coding work for higher-order tasks. You can use Studio to craft everything from order notifications, to phone trees, to survey tools, to SMS-enabled chatbots. Head over to the Studio Widget Library to learn about available widgets and their configurations. Learn more about the Liquid template language and bring additional functionality to your Flows. Visit the REST API reference page to learn more about requests you can make. Get inspired with guides based on our ready-made flow templates and common business use cases. Learn how to make an IVR, survey, and more in minutes.